Learn more about Stir Trek and Shawn Wallace, who will be presenting at the conference on April 26. Shawn Wallace, a Senior Architect with our Columbus team, is speaking at the Stir Trek conference about Event-driven Architecture, Micro-services, and the Cloud. Stir Trek is a one-day conference focused on teaching software developers, and others in the industry, the latest and greatest in technologies, techniques, and tools. Happening on April 26, the conference is already sold out, but you can sign up for a wait list! Shawn will speak about event-driven architectures, a versatile approach to designing and integrating complex software systems. Event-driven architecture is not a new concept, but as more organizations evolve and are open to moving more features to the cloud, this approach to system design has become appropriate in more situations and is worth a fresh look. In this session, we’ll talk about orchestrating enterprise workflows in the cloud using Event-driven approaches, how to build new services to participate, and design patterns for integrating existing/legacy applications. Shawn Wallace is a Senior Architect and and National Practice Lead for Custom Development and Application Lifecycle Management. 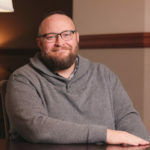 Based in Columbus, Shawn has been building software for nearly 20 years for a number of clients and even owned a software company for nine years.